100% Customer Satisfaction For Nashville, Tennessee Since 1985. Attempting to repair a broken Oven, Stove or Range without proper training and safety standards is dangerous. 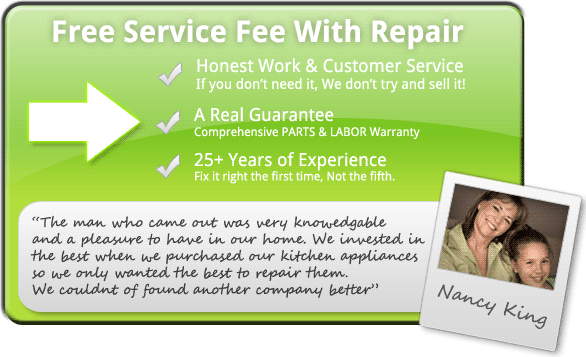 Ovens, Stoves and Ranges should only be repaired by skilled professionals who have the knowledge and experience to safely bring them out of disrepair. Repairs performed by unqualified people risk serious injury or even death. A relatively small outlet can easily carry 150 times the current needed to kill a person. Be sure to regularly clean your stove drip pans thoroughly to bring out the shine needed to properly radiate heat back. To keep them functional, clean regularly and replace every two years. Despite what you may have seen, you should never cover with aluminum foil because the foil may cause an electrical short which could cause a fire. Carefully clean around burners and elements. Inspect for irregularities and blisters on the nickel coils of the burners. This indicates that the heating element may be burned-out and needs replacement. Carefully clean around gasket seals. Use a mild, nonabrasive cleaner to clean in order to maintain proper temperature control and system efficiency. Replace corroded or brittle seals. Self cleaning ovens are generally cleaned by heating the oven to an adequate temperature to incinerate food particles. Be sure that you do not use oven cleaners in self cleaning ovens. Use oven cleaners only for nonself-cleaning ovens. By activating the self cleaning feature, you could be exposing you and your loved ones to dangerous and deadly chemical gasses. Find out more about range & oven cooking safety.